Sorin Stoica and Robert Sibiga were on midweek duty in Major League Soccer Week 12, and the action continues on Friday when Jaime Herrera makes his second assignment in the MLS middle. Herrera made his debut in Week 11, and takes charge of Philadelphia Union versus D.C. United to kick the weekend’s action off. Saturday sees the New York rivalry renewed, with Chris Penso — fourth official for both the U.S. Open Cup and MLS Cup last season — on duty for the City versus Red Bulls match-up at 3pm ET. Assistant referees Chris Strickland and Eric Weisbrod, along with fourth official Mark Kadlecik, form the rest of the crew. Sporting Kansas City are in action later that day, and they were one of the teams focused on in Paul Rejer’s most recent Play of the Week, looking at injury stoppages. This week they are up against Real Salt Lake, with Ricardo Salazar taking the whistle at Children’s Mercy Park. Nima Saghafi returns to the middle for a third assignment of the campaign — Toronto FC against Columbus Crew is his game — while Allen Chapman, Mark Geiger, Silviu Petrescu and Ismail Elfath also feature on Saturday. Elfath’s assignment is his eighth of the season — more than any other referee so far — and it comes in Seattle, where the Sounders host Western Conference leaders Colorado Rapids. 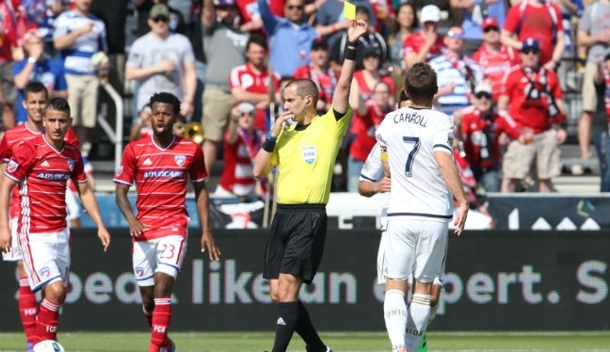 Two games take place on Sunday, with 2015 U.S. Open Cup referee Ted Unkel assigned to Portland Timbers versus Vancouver Whitecaps in the early match-up. Experienced ARs Frank Anderson and Mike Kampmeinert will run the lines. LA Galaxy’s game against San Jose Earthquakes completes the Week 12 action, with Kevin Stott in the middle for the StubHub Center clash. Stott was named MLS Referee of the Year in 2010, and Ian Anderson carries one of the flags — he picked up the AR of the Year honor in 2012.